When it comes to embracing modern cool, Baroque elegance and more styles besides, sometimes only the best metal garden furniture will do. And although teak has long been accepted as king among garden furniture materials, we think metal garden furniture makes a really strong contender. So, we’ve rounded up the finest options the shops have to offer to make sure your patio, deck or lawn is outfitted in impeccable style. Find out more about choosing garden furniture in our guide. Whether sitting, standing, or settling in for a long evening is on the agenda, there’s something here to see you right. Stuck for space? Our top tip for small gardens is the LG Outdoor Casablanca Firepit Lounge Set from John Lewis, which encompasses four chairs and a cosy circular table with an integrated fire pit: warm your hands, grill up some sausages, or even replace with an ice bucket for a sparkling soirée. Further on, there’s romantic French-style seating, loungers big enough for two, and even indoor-outdoor storage for those with a penchant for plants or no space for a shed. To find the pieces that’ll work for you, keep reading below. And, when you've finished reading, why not browse through more buyer's guides? A full set of garden furniture can mean many things and come in many configurations, but this outdoor set from LG at John Lewis has to be one of the best yet. Ideal for smaller spaces that don’t have room for a separate lounging and dining area, it integrates a small fire pit into the round dining table to create the best of both worlds. Whether cooking on the included grill insert, swapping the fire for an ice bucket and chilling a bottle of something sparkling in the middle, or just chilling out, this four-seater dining set is sure to create all the ambience you need. You might find yourself lunching in Petersfield rather than Paris, but you can still capture a little Gallic magic with this ornate metal dining set, just as at home in a shady corner of a suburban garden as parked up outside a continental bistro. The intricate scrollwork adds a touch of delicacy to an otherwise quite unforgiving material, but it’s not as dainty as it might at first seem. With a durable steel core and tough powder-coated finish, it’s rust and weather-resistant, so while that may not be good news for anyone who likes really shabby chic, it’s great for anyone who wants a pretty but low-maintenance outdoor setup. This is a must-have item for garden parties – durable and easy to move around, this drinks' trolley has been finished in a trendy and versatile charcoal grey. Don't miss our selection of the best bar carts for indoors, too. Whether for storing tools and twine, or adding container planting capacity to a small patio, a garden shelving unit can come in very handy, and this is one of the most attractive and sturdy options out there. Its Gothic and lattice details add a little antique je ne sais quoi while the sage green paint brings everything straight up to date, and again, while it might look delicate, it’s made of tough stuff thanks to a strong weatherproof finish. Finally, two generously-sized shelves give you plenty of room for pots, seed trays and anything else you can think of. If our first two furniture sets are options for cosy get-togethers, then this is certainly one for big parties and big families. When the whole clan descends for a sunny Sunday barbecue, the Marlow garden dining set from John Lewis ensures there’s ample – and bery comfy – seating, with a sofa and chairs fitting perfectly around the low-rise table. Comfy enough for lounging but strong enough to survive life outside, it boasts aluminium hardware and weather-resistant plush cushions – detachable for convenient storage and cleaning – for the best of both. Seating and surfaces aren’t the only practical metal pieces out there to add functionality to your garden – a patio heater can be endlessly useful in extending the use of your garden into the evening and through those chillier months, and this one is our top pick. The obelisk design looks good even without a flame going, thanks to its elegant streamlined profile and brushed metal finish, and the single flame inside its contemporary quartz tube adds to the overall modern effect. It’s this tube that also keeps things safe when there are curious kiddos running around, without sacrificing looks. This beautiful bench, with its romantic cottage garden air, could be just the thing for creating a cosy nook in your outdoor space. 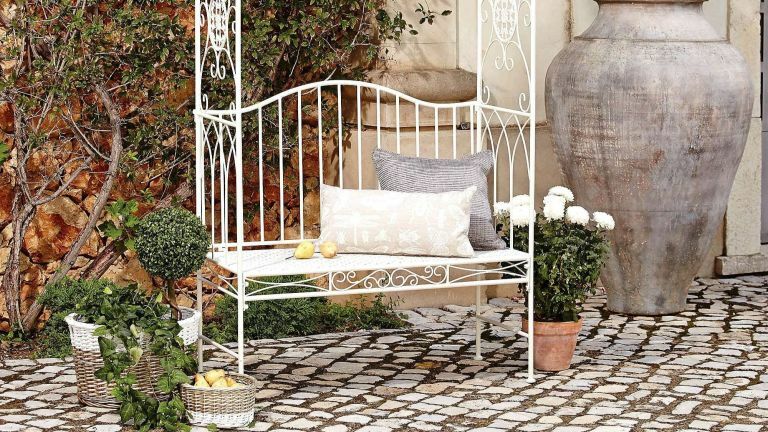 Reviewers said it assembled easily, with a gorgeous shabby chic finish to the cream paintwork that really looks the part, and while it won’t provide the shelter of a traditional solid arbour, there’s a lot to be said for that intricate metalwork. Leave it open to shine for itself, or follow the lead of one reviewer, who used it as a decorative support for climbing plants – either way, the powder-coated steel frame is sure to be able to handle it. The industrial interiors trend has been steadily making its way to the outdoors too, and that’s certainly no bad thing when it creates standout pieces like this swivel bar stool. With a deliberately aged and ‘found’ look, it has instant vintage appeal, no patience, primping or artful rusting required. Even better, it arrives fully assembled, so you can pretend you spent months scouring flea markets for old milk vats even if you’re not the handiest with a screwdriver. With a slim integrated bar at the base, it’s designed to be easier for even smaller table guests to climb onto, and the ergonomically curved seat holds sitters firm throughout the longest evenings.